Harold Gaze was born in New Zealand in 1885. He studied art in London, moved to Australia during WWI and finally settled in Pasadena, California in 1927, where he lived for over 30 years. 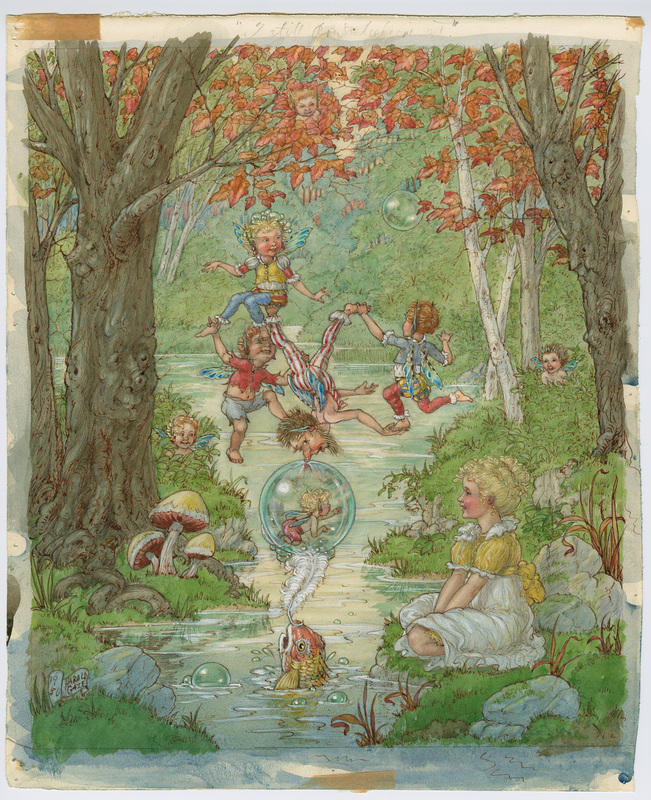 Known as “The Bubble Man” for his meticulously rendered watercolor bubbles that appear in many of his fantasy paintings. A celebrated writer and illustrator of children’s fantasy fiction, Harold created more than a dozen original stories including “Coppertop,” “The Goblin’s Glen,” and The Merry Mite series. His work can be found in the collections of Scripps College, the National Museum of American Illustration, the Pasadena Museum of History, San Diego Museum of Art, and the Kendra and Allan Daniel Collection of Children’s Illustration (Brandywine River Museum). Born in New Zealand, he traveled to London where he studied at various art schools. In the early years of the First World War, he drafted his first illustrations for the book If I Could Fly by Rose Strong Hubbell (1917). Toward the end of the war, he went to Australia, and settled in Melbourne, bringing with him a portfolio that awed critics and publishers alike. His first Australian title, The Wicked Winkapong, was distributed, with his own content in time for Christmas 1918 and cemented his vocation. In the following three years, Gaze composed and outlined eight further books for youngsters, and exhibited a portion of his work at the Victorian Artists’ Society. His quirky draftsmanship and stunning utilization of watercolor made him stand out as one of the few male artists in a field dominated by female illustrators. In the 1920s, he returned to London where he illustrated another six books. In 1927, he moved to the United States, settling in Pasadena, and living there until his death. In the 1930s, he got to be known as ‘The Bubble Man’, on the quality of a few effective solo shows which he held in Los Angeles.